Bringing up a child is the most natural thing in the world, but that doesn’t mean it’s easy, as forty-year old Laure was finding. Jack was toddling now, with a confidence far in excess of his ability to balance. To stop himself falling, he’d grab at whatever came to hand. It could be a tablecloth or a lamp. Today he got brave and weaved his way unaided across the middle of the living room, screeching with pride once he reached the little table on the other side of the room. He lifted one foot after the other off the floor, then took both hands off the table. He squealed with glee a few more times and promptly fell, mouth open, onto the edge of the table. Laure rushed to gather him in her arms. The bleeding was torrential. Had he torn an artery in his mouth? Or knocked out one of his new teeth? She struggled to take a look but he screamed and wriggled and kicked and cried. Each scream pumped out scarlet blood mixed with saliva. “Poor baby, poor baby,” she incanted as she grabbed paper towels from the kitchen. She could see a jagged wound right through his lip to the inside of his mouth. No wonder he was howling. She felt her breathing change. Harsher at first, then faster. And her heart was beating all over the place, especially in her chest and her temples. Her hands trembled despite herself. “There, there,” she intoned, barely audible above his screams. He had spat out the paper towel. She could smell his blood, his baby smell, her own helplessness. Who was there to call? The health visitor was elusive after 10 a.m., and the GP was never available. She tried some ice. Jack didn’t like it, but the bleeding was easing off. Calmer now, Jack dribbled a little blood-stained saliva onto his beloved blankie. As he was happily playing with his toys, Laure left it. She also left the bloodied paper towels on the kitchen counter as exhibits for Dan when he got in. He breezed in from work, his kiss reeking of garlic. She gave him a blow by blow account. Jack chose this moment to beam at Dan and say, “Car,” as he offered him a plastic vehicle. “It’s stopped now,” Dan pointed out. Laure’s heart was still racing. 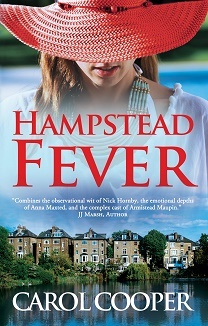 You can read more about Laure, Dan, and their friends in Hampstead Fever, available online and in bookstores.